But First, How Did We Get Here? Formal negotiations between the North American neighbors ended and an agreement was signed on November 30th, marking the start of the governments’ efforts to sell the deal to their domestic audiences and gain ratification from their respective legislatures. In the U.S., that process was complicated first by the midterm elections where the President’s party lost its majority in the House, and then by the longest government shutdown in U.S. history that delayed the publication of the agreement’s congressional assessment report, the next step of the ratification process. Despite these realities, the Administration appears to have a “shockingly optimistic forecast” on the fate of the deal, and although Speaker Pelosi shares this optimism that concerns can be addressed and an agreement passed, the reality of the challenge ahead suggests that companies, industry groups, and issue coalitions will need to vigorously engage in the debate to influence ratification in Congress, which is increasingly uncertain. The Reluctant Democrats: For Speaker Pelosi’s optimism for ratification to be well-founded, USMCA will have to gain the support of pro-trade members in her caucus. Several efforts to lobby these members are already taking form, including Trade Works for America, which was launched by influential Republicans to make their case to Democrats in traditional Republican and Trump districts, has already raised a third of its approximately $15-$20 million budget. Another group, Pass USMCA, is headed by Democrat Gary Locke, who served as Ambassador to China and Commerce Secretary under President Obama, and Rick Dearborn, who most recently served as Deputy Chief of Staff for President Trump. In bringing bipartisanship to bear in its efforts to push ratification, Pass USMCA is betting that Democrats and Republicans in Congress can be brought together in polarized Washington to ratify President Trump’s trade deal – despite Democrats’ seemingly increasing reluctance to do so. The NAFTA Warriors: Much of the declared opposition in Congress to USMCA is due to it being “too similar to NAFTA,” and this opposition includes some of the usual groups against trade deals who hold sway and influence with the Left’s liberal base. Environmental activists from Greenpeace to the Sierra Club have slammed USMCA for leaving intact “NAFTA’s bad rule book and the growth of the oil industry,” and Public Citizen and its Global Trade Watch has raised concerns over both environmental standards and labor standards that U.S. firms can use “to continue to outsource jobs to pay Mexican workers poverty wages.” For reluctant Democrats, the pressures from these groups make it politically difficult for them to support a deal that’s viewed as “more of the same,” not to mention the product of a President they are committed to resisting. 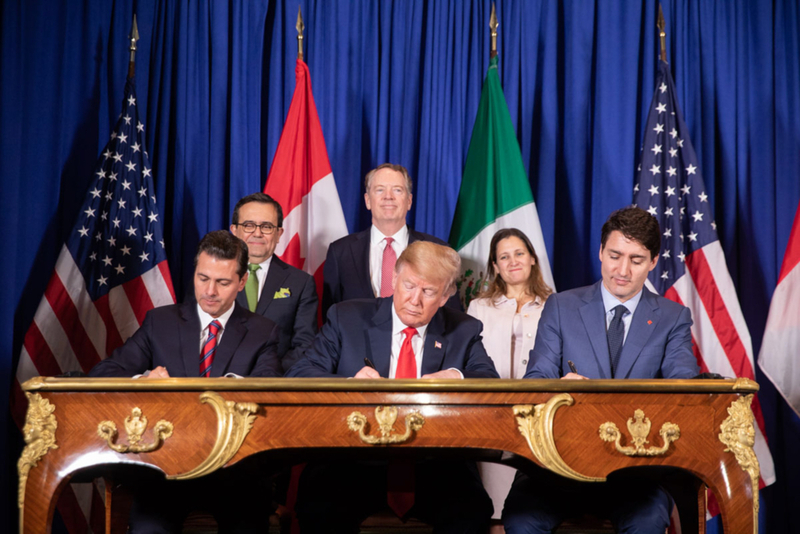 The Strange Bedfellows: The opposition to USMCA in its current form is not just made up of usual activists, however – it also includes large corporate interests and conservative think tanks. Meds For America’s opposition is focused on pharmaceutical patents and the development of generic drugs. In a letter raising its concerns to the U.S. Trade Representative, Meds For America’s broad coalition of strange ideological bedfellows was on full display. Signatories included labor unions such as the SEIU, AFL-CIO, and American Federation of Teachers; powerful interest groups like AARP; major health care company Kaiser Permanente; and, conservative organizations such as FreedomWorks and R Street Institute. The presence of these organizations that usually influence Republican policy and pressure Republican lawmakers makes it more difficult for those on the Right, especially policymakers who opposed Trade Promotion Authority, to stand up for USMCA. Those pushing ratification will need to thread a needle to navigate the challenges laid out above and build a broad, like-minded coalition that can get this deal done. To do so, they will need to pull back the layers and uncover insights into this network of opposition, including its funding, motivations, tactics, and coordination, so that they can identify potential allies – no matter how unlikely – and expose and undermine their opponents’ anti-USMCA message in the public and with policymakers. As everyone from the Pope to President Trump seem to be going all-in on artificial intelligence (AI), two companies that should be its most ardent supporters are sending out warnings about this growth. In recent SEC filings, Google and Microsoftcautioned investors that AI technologies may create ethical and legal problems that could damage their brands and the demand for their products. Microsoft’s list of potential problems includes flawed algorithms, insufficient datasets, biased information, and inappropriate or controversial data. Microsoft and Google appear to be asking for policymakers to create a regulatory framework to help make sense of this uncharted territory. The filings should also serve as a wakeup call to policymakers from companies, investors, and stakeholders, who can make headway on this issue now while the industry continues to grow – and before the challenges foreshadowed come to fruition. A Roll Call analysis found that Democratic senate candidates in 2018 who published more negative tweets were more likely to be victorious in their races, while Republican candidates were less likely to win when doing so. If this success is any hint as to the future, Republican candidates on the ballot in the 2020 election cycle can expect more of the same with withering tweets attacking them. Additionally, because many media outlets tend to reinforce Democratic attacks while pushing back on or ignoring Republican attacks, Republican candidates will have to get started earlier with uncovering the research insights that can help their campaigns win, anticipate the inevitable negative attacks, and ensure their claims are thoroughly supported by undeniable facts that can withstand the intense, and sometimes biased, media scrutiny. The reception for the outlandish plan, which triggered backlash, resulted in a bungledrollout and the removal of the plan online, followed by arguments with critics in the media about whether the document was legitimate or not in the first place (spoiler: it was). If the press is going to automatically support the GND instead of ask critical questions about it, Republican policymakers and the companies and organizations concerned by its economic and policy implications may be underestimating the degree of difficulty in putting out the truth about the harmful and costly policies it promotes. With journalists rushing to tweet their latest scoops and the world’s eyes constantly on President Trump’s Twitter account, it is easy to think of the social media platform as a representative sampling of the public discussion. But what if Twitter’s impact is overblown or misleading? Twitter revealed in its fourth-quarter earnings report that the company has an average of 27 million daily active users in the United States, or 8.2% of the total population (assuming that each account is controlled by a different person, which is unlikely). This data suggests that despite the site’s power to drive media narratives and news cycles, the “Twitterverse” is not an accurate representation of the public conversation. As more and more news stories are generated by the outrage, hashtags, and hot takes on Twitter, a misleading and dangerous trend is taking form where the 280-character antics in the “Twitterverse” are taking the place of actual fact-based information and broad public sentiments.